Quite a lot of controversy has risen in the last few days regarding Zoe Sugg and her ability to decline children’s literacy skills. An article written by the Daily Mail (boo) and followed up by The Guardian has been floating around which claims Zoella is in fact to blame for children sticking to ‘basic books’ instead of challenging themselves int he reading field. Before you start reading this post, you might want to check out the article in the Daily Mail. If you don’t know who Zoe Sugg is (more commonly known as Zoella), she is a YouTube sensation who has made a name for herself by making videos for everyone to watch…about herself…(this is a whole other blog post me talking about my opinions on this). In the last few years, Sugg has written three best selling novels in her Girl Online series and has taken the hearts of so many with her lovable characters. I personally have read the first novel in the series, it’s not to my taste, and i did write a post a few year back on how much i disagreed with the ghost writing aspect of the book. However, to claim that Sugg is to blame for children’s literacy skills declining is completely absurd. The article suggests that children who are reading books such as Girl Online, amongst others by David Walliams and Rick Riordan are behind on their ‘reading levels’ for their ages. Sixteen year olds are at the reading level of thirteen year olds and this is ‘seriously effecting their exams’. One thing that would effect their exams, is if they didn’t read at all, surely? 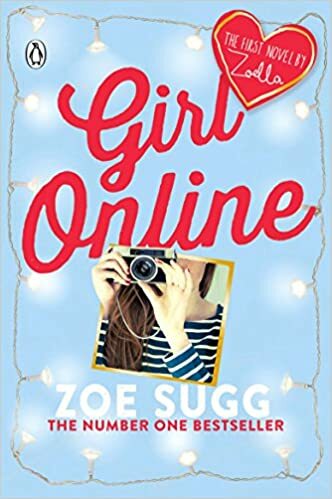 Books by these beloved authors, Sugg who many young girls look up to, Walliams who is a comedy figure for the whole younger generation are encouraging young people to read. How i see Sugg’s writing career is that, she could easily film videos from the comfort of her own home, she could put together hauls and make-up tutorials and leave young kids to watch them, feeling entertained. However, on top of her doing this, she’s writing books that she knows will sell because lets be honest, if she put her name on plastic bags she could sell them for extortionate amounts and they will always sell. These kids that are picking up Suggs books to read something their idol has read are picking up a book and reading! This could be opening up a whole new world for them, teaching them that reading is enjoyable, something to be looked at as entertainment and not something that is mandatory in school. I was a child who hated reading (part dyslexia, part ignorance), so i am very aware that it only takes one book to catapult you in to a whole world of things you would have never read before. It’s a massive snow ball effect. And that effect is happening to hundreds and thousands of children because they are interested in an author. Not only does Sugg write novels, she joined forces with WHSmith a few years back to bring a the masses a very casual Book Club. The books she picked out herself are sold as part of her own Book Club through WHSmith, and i can guarantee a lot of young people are going to pick them up because they’re right next to a photo of Sugg’s smiling face. They want to read what their idol has read and be apart of those worlds too. How is this ruining children’s literature skills? More importantly, the Daily Mail article seems to shame genres and ‘age limits’ on books. Surely if you’re twelve you’re way too only for a novel meant for nine to eleven year olds, how could you even think of picking that up!? Well guess what? Reading is reading, and reading anything is something to be celebrated. I am twenty two years old and i am at my happiest reading Young Adult stories, that are in fact published for absolutely anyone of any age to read. There is a huge stigma attached to reading, what we should be reading at what ages and how we should challenge ourselves to be better. In reality, a huge part of reading is the entertainment factor. People read because they enjoy it. I would very much like to see the stats and facts about how reading will make you more ‘dumb’ as interpreted from said article. I am in no way a fan of Sugg’s, quite the opposite, but i’m also not a fan of the way that big boss men in fancy suits can rain on the reading parade of so many people. Reading anything is an education, don’t be ashamed of what you read, and there are people like Sugg that are truly out there to help more kids read. I’m not a fan of Zoella, like you, but I thought the article was completely ridiculous. Like you said, surely if kids are reading, even if they’re books with a younger target audience, that’s 100% better than reading nothing at all?! And people knock the books in Zoella’s book club for being for a young audience, but I want to read most of them myself, haha! I think most of it comes from older people writing these articles who are completely clueless about what YA is, and who reads them. Gahhh! I’m a firm believer in “anything is reading”, even if that means magazines or books aimed at middle schoolers. It is this kind of shaming by the Daily Mail that will make people self-conscious about what they read and make it into an issue. If children’s reading ages are below average in secondary school then the problem lies somewhere else. So true! I love Girl Online, Zoella, and the message she promotes.